The first Truth and Tidings was published in May, 1948. It was a sample issue and was followed by the first monthly copy in July The editors were Albert Joyce, Fred Watson, Gordon Johnston and Hector Alves. That first issue contained articles by the four editors and four others: W Fisher Hunter, John Gray, Mervin Paul and Sydney Porteous. Many hundreds of articles have followed for our instruction and the Tidings have proved to be a much needed link between assemblies. Mr. Joyce continued to edit the magazine until June, 1977, but in 1974, John Norris took over the Treasurer’s work from Mr. Jack Joyce and assisted in editorial work until in 1977, he became editor. Brother Norris health was also failing, so that in April, 1977, he invited Sydney Maxwell and Norman Crawford to help him. The July, 1977 issue lists Norman Lorimer as the Missionary Secretary and Hector Alves, Sydney Maxwell and Norman Crawford as Associate Editors. Brother Lorimer had been giving help to Mr. Joyce from the very first issue in 1948. Brother Norris’s health continued to fail, so that in the fall of 1978, Mr. A. W. Joyce, Jack Joyce, N. Lorimer, Mr. and Mrs. Norris and N. Crawford met at Cambridge, Ontario. It was agreed that N. Crawford would be editor, N. Lorimer, News editor, and Sydney Maxwell and Alex Joyce would be Associate Editors with Robert Reilly as Treasurer. It was a sore loss to us when our beloved brother Maxwell went to Heaven in 1993. Other brethren have been asked to join the staff: David Oliver in 1985, and Eugene Higgins and Albert Hull in 1994. Mr. and Mrs. Robert Reilly ably took care of subscriptions for many years until in 1994, Mr. and Mrs. Paul Glenney took over this arduous work. Brother Reilly continues to be the Treasurer. We owe heartfelt thanks to so many who have worked with us through the last 20 years to produce and mail the magazine. For years, volunteers from the Jackson assembly worked on the mailing. Doreen Buck was one of the first and she and her husband, Bob, still do the mailing. The Elwood Russells of Lurgan, N. Ireland have helped us much. “God is not unrighteous to forget your work” (Heb. 6:10). For over 15 years, A. J. 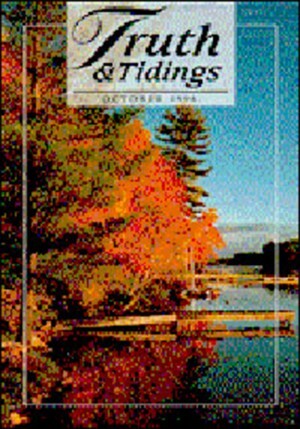 (Sandy) Higgins, has contributed articles and series of article to Truth and Tidings. He has accepted our invitation to take over as editor from January, 1997. We are deeply thankful to God for our beloved brother. God has gifted and fitted him and we believe that in his capable hands the magazine can continue to be a rich blessing. The pre-press, printing and mailing will still be done in Jackson, MI. A master copy is given to the printer who reproduces each issue from the master. We ask for your prayers that this work will still be to God’s glory and the blessing of His people!